Like everyone else, elite investors make mistakes. Some of their top consensus picks, such as Amazon, Facebook and Alibaba, have not done well in October due to various reasons. Nevertheless, the data show elite investors’ consensus picks have done well on average over the long-term. The top 30 S&P 500 stocks among hedge funds at the end of September 2018 returned an average of 6.7% through November 15th whereas the S&P 500 Index ETF gained only 2.6% during the same period. Because their consensus picks have done well, we pay attention to what elite funds think before doing extensive research on a stock. In this article, we take a closer look at Eastman Kodak Company (NYSE:KODK) from the perspective of those elite funds. Is Eastman Kodak Company (NYSE:KODK) worth of considering right now? Neither are hedge funds from our database becoming more optimistic about it nor are loosing interest for it. At the end of the third quarter there were five smart money investors long the stock, same as in the previous quarter. Eastman Kodak Company is far from being on of the favorites stocks in recent months. (If you are curious to see which stocks have attracted the most attention from smart money investors take a look at the list of 30 most popular stocks among hedge funds in Q3 of 2018.) In this article we’ll analyze Eastman Kodak Company further more. In the eyes of most stock holders, hedge funds are seen as unimportant, old investment tools of years past. While there are greater than 8000 funds with their doors open today, Our researchers look at the aristocrats of this club, around 700 funds. These money managers command the lion’s share of the hedge fund industry’s total capital, and by paying attention to their best investments, Insider Monkey has found several investment strategies that have historically outrun the broader indices. Insider Monkey’s flagship hedge fund strategy outperformed the S&P 500 index by 6 percentage points annually since its inception in May 2014 through early November 2018. We were able to generate large returns even by identifying short candidates. Our portfolio of short stocks lost 26.1% since February 2017 even though the market was up nearly 19% during the same period. We just shared a list of 11 short targets in our latest quarterly update. We were carefully researching to collect more data about Eastman Kodak Company (NYSE:KODK), and we have managed to track down RiverPark Short Term High Yield Fund and RiverPark Strategic Income Fund’s Q3 2018 Commentary Letter. In this letter, RiverPark also talks about Eastman Kodak Company’s recent moves, and shares its opinion on it. Continuing with our analysis we’ll take a peek at the key hedge fund action regarding Eastman Kodak Company (NYSE:KODK). 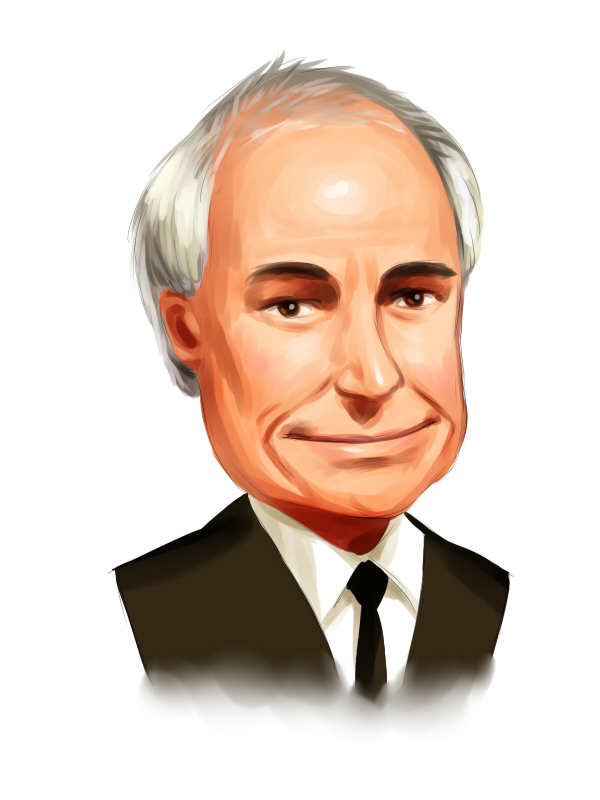 How are hedge funds trading Eastman Kodak Company (NYSE:KODK)? At the end of the third quarter, a total of 5 of the hedge funds tracked by Insider Monkey were long this stock, same as in the second quarter of 2018. 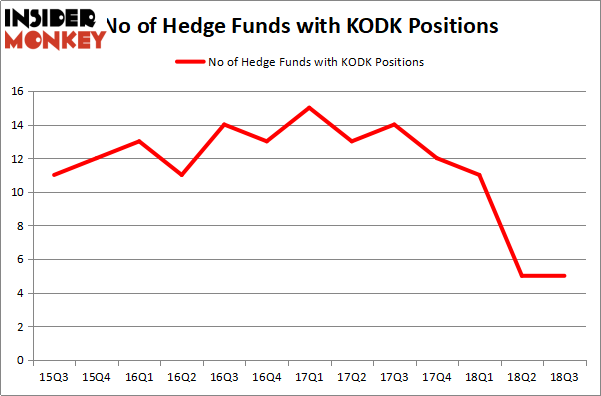 Below, you can check out the change in hedge fund sentiment towards KODK over the last 13 quarters. With hedge funds’ positions undergoing their usual ebb and flow, there exists an “upper tier” of noteworthy hedge fund managers who were upping their stakes significantly (or already accumulated large positions). Among these funds, Southeastern Asset Management held the most valuable stake in Eastman Kodak Company (NYSE:KODK), which was worth $15.4 million at the end of the third quarter. On the second spot was Citadel Investment Group which amassed $0.1 million worth of shares. Moreover, D E Shaw, Citadel Investment Group, and AQR Capital Management were also bullish on Eastman Kodak Company (NYSE:KODK), allocating a large percentage of their portfolios to this stock. Since Eastman Kodak Company (NYSE:KODK) has faced declining sentiment from the aggregate hedge fund industry, it’s safe to say that there is a sect of fund managers that elected to cut their full holdings in the third quarter. It’s worth mentioning that Matthew Hulsizer’s PEAK6 Capital Management dumped the largest stake of the 700 funds followed by Insider Monkey, totaling an estimated $0.1 million in call options. Bart Baum’s fund, Ionic Capital Management, also sold off its call options, about $0.1 million worth. These moves are important to note, as aggregate hedge fund interest stayed the same. This is a bearish signal in our experience, and taking all discussed here into account, we would skip this stock and consider some of the more popular ones for a longer run. Is Ulta Beauty, Inc. (NASDAQ:ULTA) A Good Stock To Buy? Hedge Funds Are Underwhelmed by Sanofi (SNY)’s Growth Prospects Is It Time to Follow Hedge Funds Into BP p.l.c. (BP)? Hedge Funds Are Dumping C.H. Robinson Worldwide, Inc. (NASDAQ:CHRW) Billionaire Ken Fisher is Betting Big on this Japanese Banking Giant Is Old Dominion Freight Line, Inc. (NASDAQ:ODFL) A Good Stock To Buy?